Bite-sized bacon-wrapped shrimp appetizers are easy to prepare, plus they look and taste elegant enough for a very special party. For serving, transfer them to a warming tray or place them in a slow cooker. Generally, a pound of medium shrimp should make about 45 appetizers. Large shrimp would make about 30 to 35 and would use 10 to 12 strips of bacon. The recipe is easily multiplied for a crowd. Soak about 45 toothpicks in water. Peel the shrimp, leaving just the tails on if you like. With a sharp knife, make a shallow cut down the back of the shrimp. Pull or scrape out the dark vein. Rinse each shrimp and put them in the ice water as you work with the remaining shrimp. With scissors or a sharp knife, cut the bacon crosswise into thirds. Lay the shrimp out on a work surface and blot dry with paper towels; sprinkle them with garlic powder and a little salt. 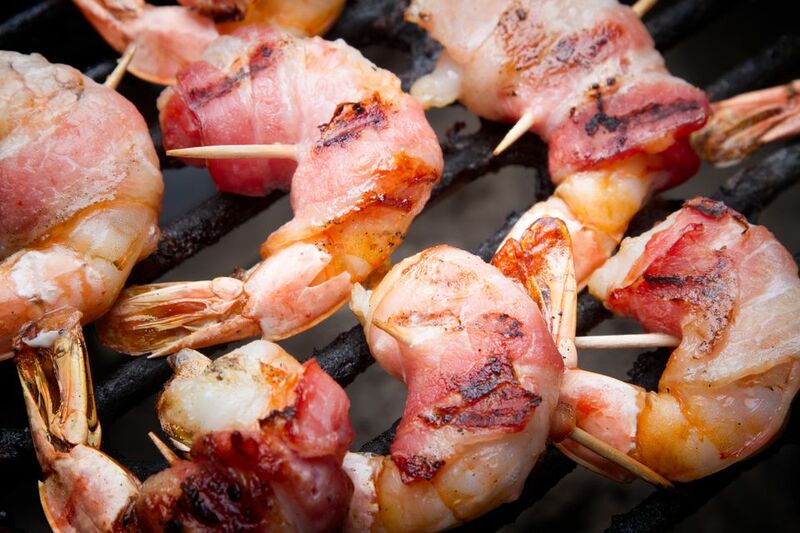 Wrap a shrimp in a piece of bacon and secure it with a toothpick. Arrange the wrapped shrimp on a broiler rack. Repeat with the remaining shrimp and bacon pieces. Broil the wrapped shrimp, turning occasionally, 3 to 4 inches from heat for about 6 to 10 minutes total, or until bacon is crisp around the edges and browned. Serve immediately or transfer the shrimp to a warming tray or slow cooker for self-serving. Have a plate or bag available for guests to discard the used toothpicks. Refrigerate any leftovers, covered. You can enjoy the leftovers cold or reheat them in the microwave or by broiling them for a short time. The recipe is easily multiplied. If you are doubling or tripling the recipe, work with about 1 pound at a time and keep the wrapped raw shrimp in the refrigerator as you work with subsequent batches. Alternatively, prepare and cook each batch separately and keep them warm in the slow cooker, warming drawer, or warming tray while preparing the remaining shrimp. Marinate the shrimp for 30 minutes in the refrigerator in about 1/2 cup of Italian dressing before wrapping them with bacon. Make a quick marinade with 2 tablespoons of extra virgin olive oil, 4 tablespoons of lemon juice, a few tablespoons of fresh chopped parsley, and 1/4 teaspoon each of kosher salt and freshly ground black pepper. Marinate the shrimp for 30 minutes in the refrigerator before wrapping them with bacon. Brush the shrimp with a mixture of melted butter, maple syrup, and chili powder before wrapping them with bacon. When the bacon is crisp under the broiler, brush again with the butter mixture as a glaze as broil a couple more minutes.